As We Perform It is a two-week, group exhibition at Franklin Street Works that brings together emerging and mid-career artists who use performance, painting, video, photography, and social practice to expand on the rich, ever-evolving role of contemporary art as a tool for exploring self-representation. This exhibition is the first by emerging curator and Franklin Street Works’ staff member Sandrine Milet. It is on view from June 22 – July 7, 2013, with a free, public reception on Saturday, June 22, from 5:00 – 8:00 pm. Exhibiting artists include Lisa Fagan, Christina Sukhgian Houle, Kristin Lucas, Erica Magrey, Peter Bonde Becker Nelson, Dani Padgett, Bastienne Schmidt, Devan Shimoyama, and Thuan Vu. These themes in As We Perform It are expressed in a variety of ways. Artists such as Peter Bonde Becker Nelson, Bastienne Schmidt, and Devan Shimoyama create narratives that blend autobiography with the imagined, while also investigating the self’s ability to change and transform. Lisa Fagan, Christina Sukhgian Houle, Erica Magrey and Dani Padgett focus on the body and mind in relation to our physical and social environments, oftentimes foregrounding performance. 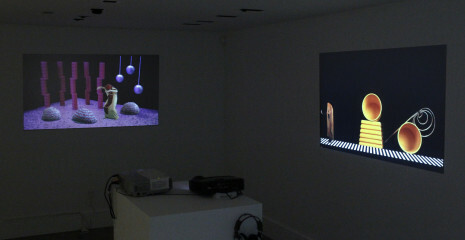 Paying close attention to the political environment of the 21st century and its impact on identity, Kristin Lucas and Thuan Vu draw connections between their personal identities and the larger construct of the hyper-mediated world, bringing an understanding of the new and existing shared platforms. As We Perform It features works made by artists who spent their formative years in the 21st century’s hyper-connected world where physical and digital lives collide. Focusing on the “multi-place-ness and multi-space-ness” of our society, as described by exhibiting artist Erica Magrey, the show, among other things, asks how the prevalence of expressing identity through immediate visual cues has affected contemporary art practices. Many of the works in As We Perform It map out experiences or narratives through performative self-representations in an attempt to answer the “where and how am I” inquiry, propagated by our sharing-obsessed society.